New Scale Robotics, a newly-formed division of New Scale Technologies, Inc., has introduced an electric parallel gripper targeting precision assembly and inspection with collaborative robots. 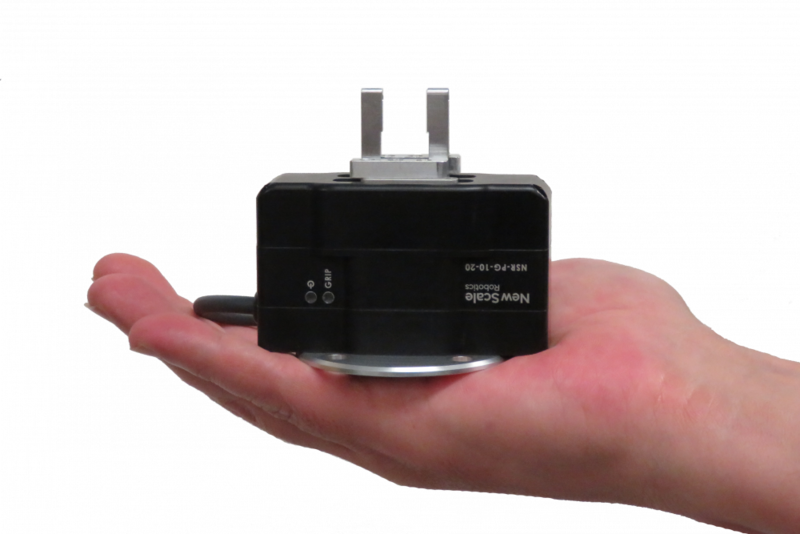 The NSR-PG-10-20 Precision Parallel Gripper is the smallest, most precise smart gripper available for collaborative robots including the UR3, UR5 and UR10 robots from Universal Robots (UR). “We created this smart electric gripper specifically for agile automation with collaborative robots, using our extensive experience making small mechatronic motion systems,” said David Henderson, CEO of New Scale Technologies. The company has created a new division and website to better reach and serve industrial automation distributors and end users. Simple and complete gripper systems that can be installed and begin manipulating parts in a few minutes. Application software that is quickly and seamlessly “taught and re-taught” new gripper commands, and synchronizes with robot motion. Smart gripper designs that embed sensors and electronics to provide force control, size measurement, and error detection. Compact and easy-to-use systems that minimize cables, tubing and external electronics. The NSR-PG-10-20 meets these goals while specifically targeting small part manipulation using the newest and smallest collaborative robot arms. At 175 grams, the NSR-PG-10-20 is the lightest and smallest electric parallel gripper available. The modular fingers can be modified to accept a variety of part shapes. Part size can be measured with 30 micrometer precision. The 20 mm stroke provides maximum flexibility. The gripper can handle workpieces up to a recommended maximum of 100 grams. Download the data sheet for additional specifications. The NSR-PG-10-20 is available directly from New Scale Robotics at an introductory price of $3,600. The company also plans to offer the gripper through collaborative robot distributors.